Each Sunday my sister Ashlie and I co-write a blog post about our favorite things called Sister Sister Sunday. Sister Sister Sunday is a great way for us to keep in touch every week and stay connected. Each week our theme changes so make sure to visit us every Sunday to check out what we are into next. January is G.O. (Get Organized) Month so Ashlie and I wanted to show you how we organize our makeup. This will be fun because you will get 2 different perspectives, Ashlie is a busy mother of twins/teacher/wife and I am a Professional Organizer. Enjoy! Organizing makeup can be an ongoing task. It is something that most of us access everyday and it is something that can get out of control for all of those cosmetic lovers out there! I have finally found a system that works for me. It is not really complicated…in fact it is quite simple. 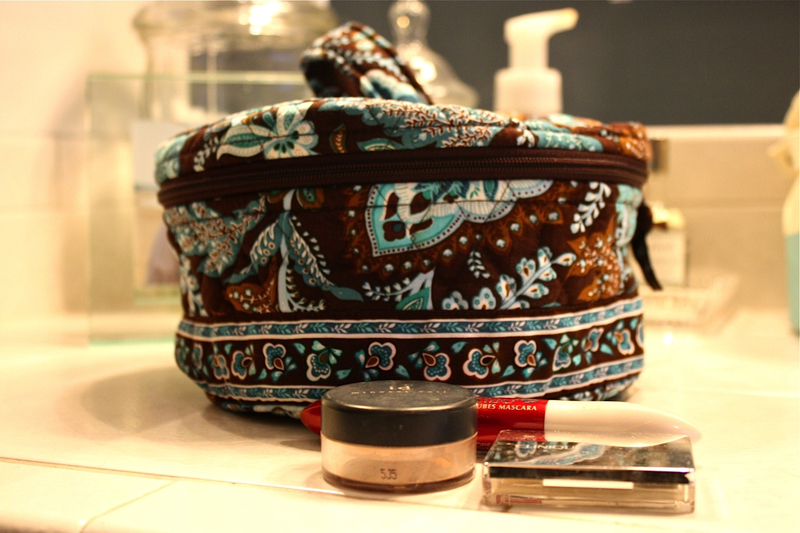 I love my Vera Bradley make-up bag. 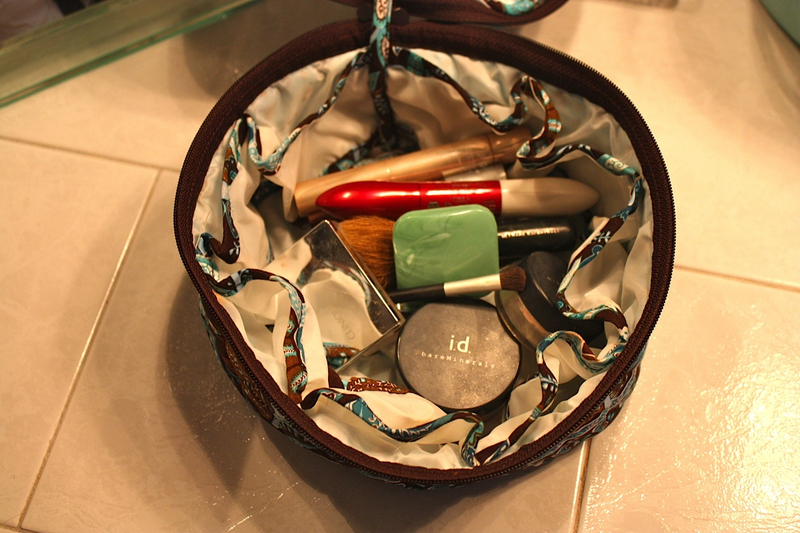 I have a few other ones that I use when I travel, but this particular make-up bag has been helpful in keeping me and my daily makeup under control! I love that it is large enough for my full size containers of foundation and blushes, as well as all of my brushes, eyelash curlers, and daily moisturizers. It also has a zipper pocket on the top of it that I use to hold jewelry when I am on the go. 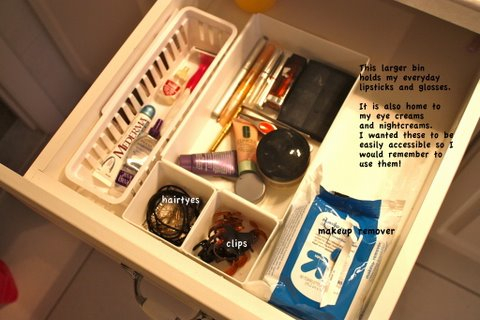 Another helpful thing that I have started to do is keep some of my make-up “extras” in a drawer in my bathroom. Inside the drawer I placed some little baskets and bins to contain some of the other daily products that I use. This little system has helped keep these products at arms reach. No more searching around in my dimly lit bathroom cupboards! 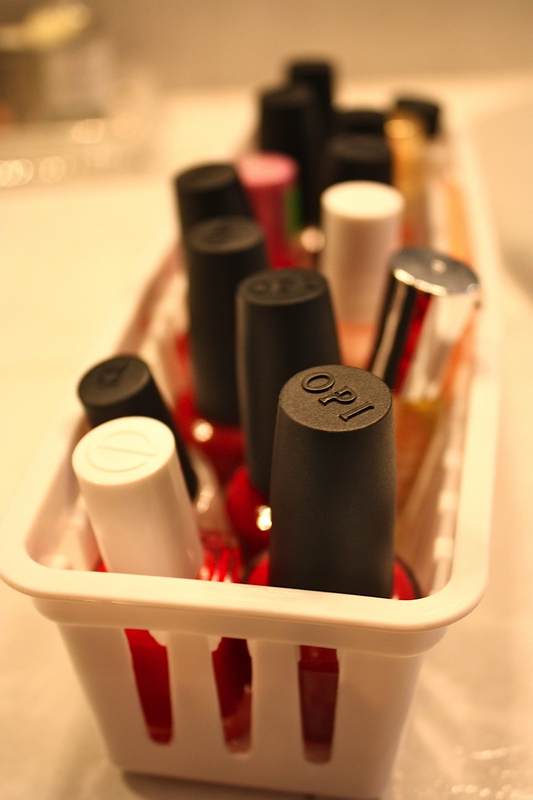 Because I found this little basket system so helpful I have also applied it to other products….I love that all of my nail polishes are together and ready for use! Now I can find the perfect shade without digging around in the basket I used to keep them in. Velcro is my friend when it comes to organizing my makeup. In the house we are living in I am lucky to have a lot of drawer space in the bathroom vanity so I set up an easy to use makeup drawer. You could also set something up in a cabinet. Walmart carries white drawer organizers in packs of 3 for only $0.99 so I picked up about six sets in a few different sizes. I like these because they are inexpensive and if they get yucky you get simply recycle them. You can find velcro in any craft department, I like to use the velcro dots because they are perfectly sized and precut. Measure out the drawer and place the organizers where you want them to go before you use the velcro, once the velrco is attached to the drawer it is not easily removed. Once you know where you want them to go, place both of the velcro pieces to the bottom of the organizer. The bottom of the velcro once it is attached should be sticky, once it is applied, firmly place them in the drawer. Doing it this way you can guarantee your velcro dots match up. After they are attached you can pull the organizers out at anytime and then simply reattach the velcro when you put them back. bronzer and blush, and eye shadows and tools. Below is my lip/travel perfume section. bins don’t all slide to the back of the drawer. Mascara : Every 3 months. Eyeliner: 1 year unless you use it with water, then it should be tossed after 6 months. Be sure to sharpen your pencils after each use to keep them clean. Foundation: If you use your fingers to apply it every 6 months, if you use a sponge every 12 months. Remember to wash your sponge out each week and replace it every three weeks. Cleansers & Moisturizers: Most of these products contain fatty acids which means they should be thrown out after 6 months. Nail Polish: Every 12 months, remember to store it in a cool dry spot. The best place is actually the fridge. Makeup Brushes need to be washed every 2-3 months. Concealer: Up to a year. Eyeshadow and Pressed Powder: 2 years. Lipstick: 2 years if stored in a cool place. When in doubt sniff it out! If you don’t remember how old something is try smelling it, if it smells funky you know it is time to replace it. The clock on your makeup begins when you open it. A fun tip I suggest is to keep a sharpie in your makeup drawer so you can write the date you started using on the bottom. Thanks for sharing how you organize. I organize my stuff with bins too, but I don't have them velroed down. Have a great day! Thanks for hosting the link party again and thanks for the idea to use velcro strips to keep the trays in place! Such a simple, brilliant idea. I never thought to velcro my little baskets down! Great idea! Thanks for sharing all the fab tips! I organize my ear rings in a mini muffin tin. It slides around, now I can Velcro it to the drawer. Thanks! Right now I am loving the seasoning Old Bay. It reminds me of my home in Maryland and perks up so many recipes, like my deviled eggs. Have a great week! Thank you so much for featuring my blue hutch! What a wonderful surprise!!! I am touched. Kinda jealous of your organization! I wish I had that much room to separate everything! Oh my… the lifespan on make-up, Really?? I've got stuff I need to throw out for sure. Thanks for the post. Just found your blog through the link up over at Fingerprints on the fridge! I love it! Now I will probably be up all night looking through your archives! Ha! I am also a new follower and would love if you would follow me too! Love the way you organize. Thanks for the velcro tip! Wow! Amanda these are all great ideas! Thank you for sharing. I found you at SUYL. Love the Velcro idea!!!! I use Velcro for so many things (I am a teacher) this will be my next project!